If you've been out of the loop, you may not know that I'm pregnant! And almost to the halfway point at that. It's hard to believe how quickly it has gone by. With that being said, I wanted to share three gorgeous spring maternity dresses that are affordable, quality, and perfectly comfortable/appropriate to wear in the classroom (or not, if you're not a teacher like I am). 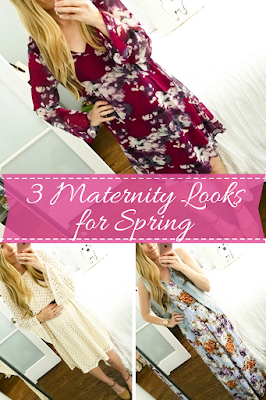 What I love so much about each of these dresses is that even though they are maternity, I know I'll be able to wear them even as non-maternity dresses as well! That's a win-win if you ask me, since I've been trying not to spend too much money on maternity clothes :) All dresses were sent to me care of Shop Pink Blush, but all opinions are my own! They also have some incredible non-maternity styles as well. I couldn't be more in love with the lace detailing on this dress. Then add in the sleeves, and it's simply one of those pieces you can't pass up adding to your closet. I'll be wearing this all throughout spring as well as for either our baby shower or gender reveal party as we get closer to my due date. You can grab the dress here, and shop the rest of the look below. Talk about the perfect dress to take you from teaching right to those hot spring/summer days. I'm sure I'll be wearing this all the way through the summer until August. The floral pattern adds such a nice touch of femininity! Grab the dress here and shop the rest of my look below. I am NOT usually a pink person (or much of a color person for that matter), but the purples in this dress completely caught my eye - as did the chiffon material, which is incredibly comfortable and airy as I get sweatier (gross I know) a lot more easily! You can grab this dress here and the rest of the look below! That blue maxi...be still my beating heart! You look beautiful within these maternity dresses. All your maternity dresses are so pretty and fashionable.